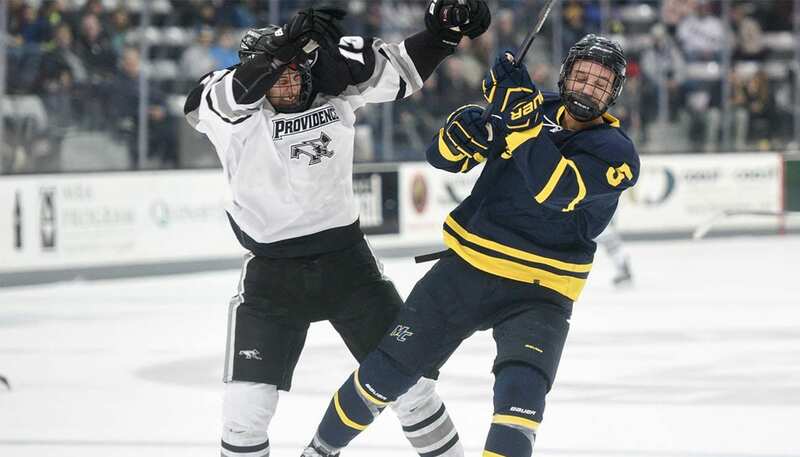 Providence College men’s ice hockey player Garrett Gamez ’19 (Chino Hills, Calif.) was putting together a fine sophomore season when he collapsed on the bench during a March 11 Hockey East playoff game at Notre Dame. 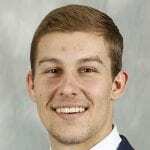 He was cleared to return home after overnight observation in a local hospital, but was held out of the Friars’ season-ending NCAA Tournament game against Harvard. One of the Friar fans present that night was Mike Leonard ’70 & ’00Hon., himself a former Friar hockey player who lives in Winnetka, Ill. He also is a retired NBC News correspondent whose 30-year career was most notable for regular Today show feature stories. Now an independent filmmaker, Leonard often travels with his trusty video camera, especially when those travels involve his alma mater and its hockey team. One of those shots depicts Gamez, praying intently moments before taking the ice for that fateful game. Medical testing will continue until mid-summer, and doctors have not yet determined whether it will be safe for him to resume his playing career. Leonard was unaware of the seriousness of the situation until a few weeks later when he was visiting campus and he ran into Gamez’ teammate and roommate, Vincent Desharnais ’19 (Laval, Quebec, Canada). Desharnais, Leonard said, “expressed concern for Garrett” and described the emotional scene when Gamez returned from Notre Dame after his hospital stay, reuniting with his worried friends. Leonard knew he was looking at a remarkable story, and he was struck by the fact that he had been there for that critical moment in Gamez’ life — a moment with which Leonard could identify as one who appreciates what camaraderie and competition mean to a high-level athlete. The next morning, Leonard and his documentary producing partner, Mary Kay Wall ’13P, ’15P, ’18P, & ’20P, interviewed Gamez, Desharnais, and their roommates, Scott Conway ’19 (Basingstoke, England) and Hayden Hawkey ’19 (Parker, Colo.). Leonard and Wall also produced The Promise of Providence, the acclaimed PC centennial film that debuted in October.